ST. PETERSBURG, Fla. -- Dante Bichette Jr. is among the trio of Staten Island Yankees and league players of the year that make up the Topps Short Season-A/Rookie All-Star Team. The best performances in all Minor League Baseball™ classifications are again being honored by the Topps Company of New York, N.Y., in conjunction with Minor League Baseball. Dean Green (22) of Berryhill, Okla., finished second in the New York-Penn League with 84 hits and a .520 slugging percentage. The Connecticut Tigers first baseman ranked third in the league with a .341 batting average and .915 on-base plus slugging percentage. The Detroit Tigers Drafted Green in the 11th round in June out of Barry (Fla.) University. 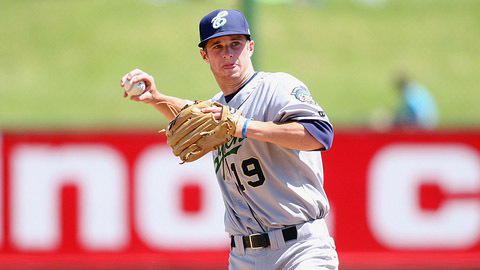 Cory Spangenberg (20) of Clark Summit, Pa., hit .384 with 10 doubles, 20 runs and a 1.080 OPS for the Eugene Emeralds. The second baseman played in just 25 games for the Emeralds before earning a promotion to Class A. The San Diego Padres selected Spangenberg in the first round (10th overall) in June out of Indian River (Fla.) State College. Dante Bichette Jr. (19) of Orlando, Fla., led the Gulf Coast League with 47 RBIs, 67 hits and 17 doubles in being named the circuit's Most Valuable Player. Bichette also excelled in the field for the Yankees by leading all GCL third baseman with a .945 fielding percentage. The New York Yankees, who promoted Bichette to the Staten Island Yankees in September, selected him 51st overall in June out of Orangewood Christian (Fla.) High School. Joe Panik (21) of Hopewell Junction, N.Y., led the Northwest League with a .341 batting average, 92 hits and 54 RBIs with the Salem-Keizer Volcanoes. He tied for the circuit lead with 49 runs and led all NWL shortstops with a .964 fielding percentage in winning league Most Valuable Player honors. The San Francisco Giants took Panik with their first round pick (29th overall) in June out of St. John's University. Joc Pederson (19) of Palo Alto, Calif., led short-season players in the domestic-based leagues with 64 RBIs. He also finished in the top five in the classification with 94 hits and 54 runs. The Ogden Raptors outfielder was also among the Pioneer League leaders with his .353 batting average and 24 stolen bases. The Los Angeles Dodgers drafted Pederson in the 11th round out of Palo Alto (Calif.) High School in 2010. Eddie Rosario (20) of Guayama, Puerto Rico, led short season players in the domestic-based leagues with 21 homers, 71 runs and a .670 slugging percentage. The Elizabethton Twins outfielder, who was named a Co-Player of the Year in the Appalachian League, was also among the top four in the classification with nine triples, a 1.068 OPS, 60 RBIs and 39 extra-base hits. The Minnesota Twins Drafted Rosario in the fourth round in 2010 out of Rafael Lopez Landron (PR) High School. Mason Williams (20) of Winter Garden, Fla., led the New York-Penn League with 94 hits and tied for the league lead with 28 stolen bases. The Staten Island Yankees outfielder ranked second in the circuit with a .349 batting average and six triples. The New York Yankees selected Williams in the fourth round in 2010 out of West Orange (Fla.) High School. Jorge Alfaro (18) of Sincelejo, Colombia, hit .300 with six homers and 23 RBI with the Spokane Indians. The catcher had a .481 slugging percentage, an .826 OPS and recorded 48 hits in 45 games. The Texas Rangers signed Alfaro as a non-drafted free agent in January 2010. Elvis Araujo (20) of Maracaibo, Venezuela, led Arizona League pitchers with nine wins for the Indians. The left-hander, who missed the past two seasons due to injuries, also limited opposing batters to a .229 average, tops among AZL starters. Araujo's 58 strikeouts and 1.14 WHIP ranked third in the league. The Cleveland Indians signed him as a non-drafted free agent in July 2007. Branden Pinder (22) of Corona, Calif., went 2-2 with a 1.16 ERA and 14 saves for the Staten Island Yankees. The right-hander had a 0.68 WHIP and held batters to a .152 average. He struck out 38 in 31 innings and walked only five. The New York Yankees drafted Pinder in the 16th round in June out of Cal State Long Beach.